In addition to helping people to sign up for small groups through My ChurchSuite or the Embed small group list you might have on your website, you can also run small group sign-up at your church's Information Desk using ChurchSuite Connect - Connect is what we call ChurchSuite's Sunday-facing features; one of those features is called Group List. 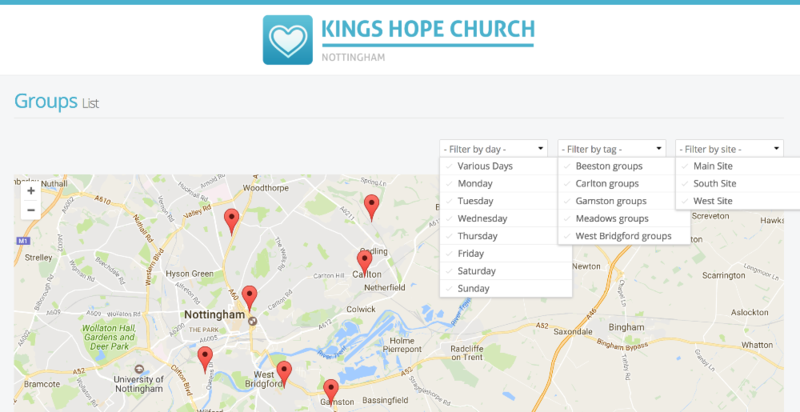 The Connect "Group List" application enables churches to display a list and/or map showing their active and future small groups on a device at their Information Desk; for people to browse the menu of groups you offer and even sign-up there and then! This can be especially useful to enable non-church members (i.e. those not yet in your Address Book) and those unable to easily access My ChurchSuite to sign up to small groups quickly and easily. 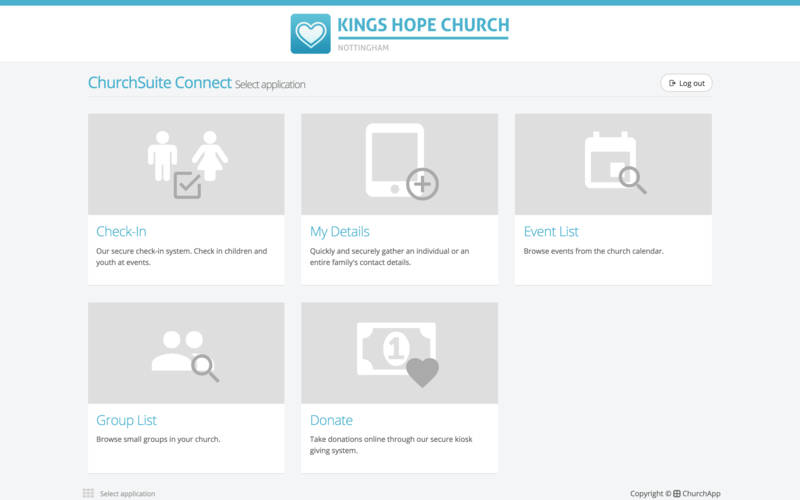 This article will explain an overview of the sign-up process and the workflow within ChurchSuite. We'll then demonstrate the process for enabling your groups to be included in the Connect on a group by group basis so that they show in the "Group List" application. Connect "Group List" sign-up functionality works on a group-by-group basis, allowing you to enable the sign-up feature for some groups in Connect but not others; while still retaining the ability to show your other active and future groups in the list or map, even if they are full or not yet open to sign ups, if you wish. 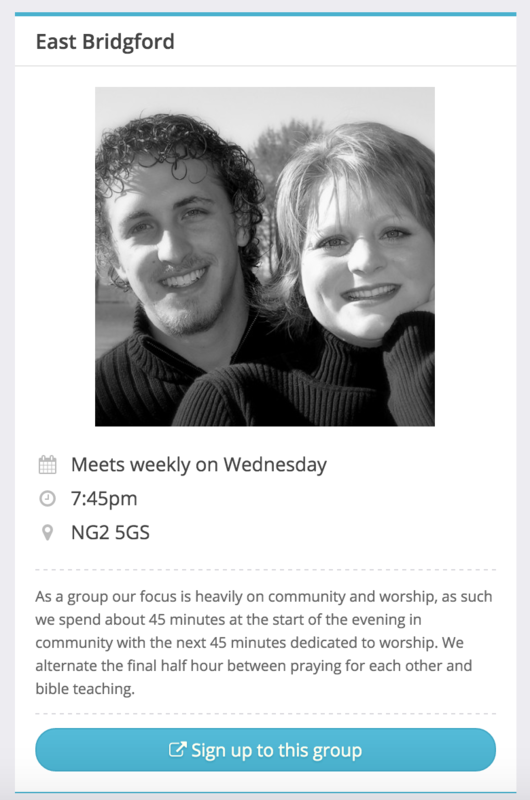 This is useful where you want to present the small groups that are running in the life of your church, even if they are full or not open to sign-ups currently, rather than displaying an empty list! 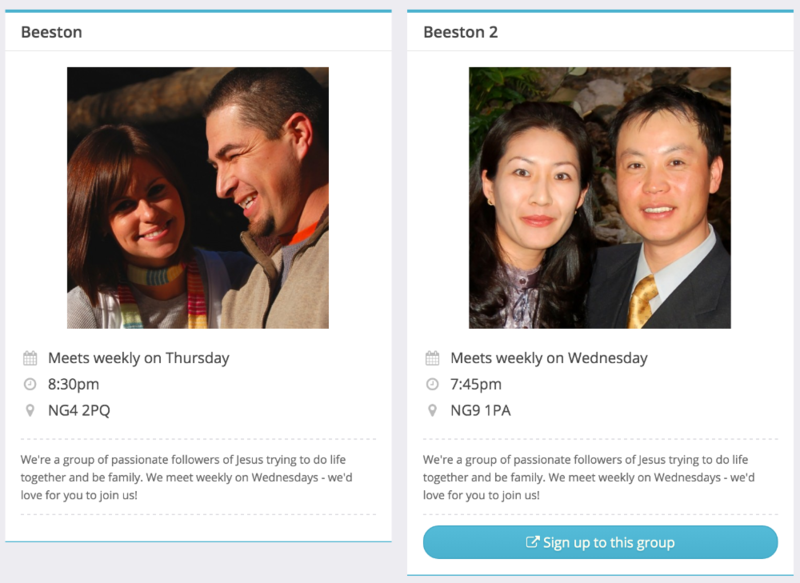 The Small Groups module settings enable churches to customise the Connect > Group List to show or hide certain features to enhance the user experience when they're viewing your groups and signing up. 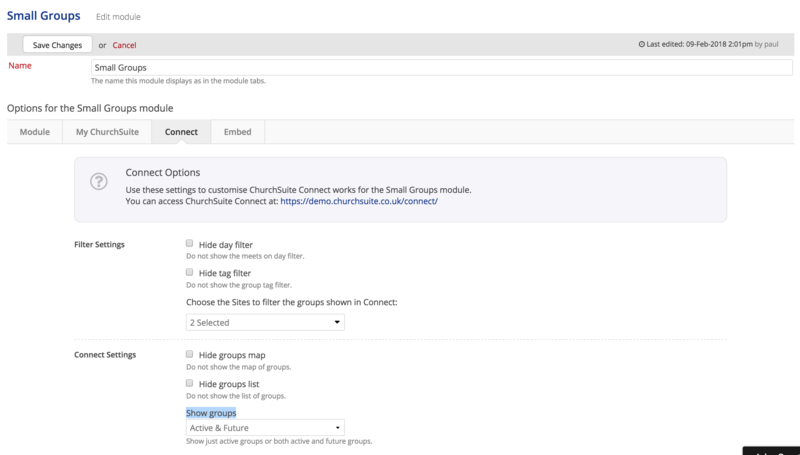 Connect > Group List also uses some of the same module options as Small Group Embed - the settings on the Small Groups > Embed tab for Notifications and Custom Fields apply to both Connect and Embed and cannot be set independently for each platform. You can select whether to show just your active groups (the default), or to also show future groups. In this way, future groups can be shown even if the sign-up period has not yet started. Note that this option still respects each group's visibility settings, so that you can still choose to show some future groups but not others, if you wish. You can specify which small group roles are optionally notified when someone signs up to a group - perhaps the small group leader, or the small group host - ensuring that new sign-ups are not missed, but identified quickly and welcomed to the group. Head to "Small Groups" module > "Roles" section, select the appropriate role(s) and tick the "Notify of Sign-ups" option. Then simply make sure the appropriate members/leaders/hosts are assigned that role in the member list for each group. Small group sign-ups can be added automatically to a Flow. We provide you with separate options for new contacts and existing contact sign-ups; for example, you can have newcomers added to a different flow to the one that existing contacts might be added to. 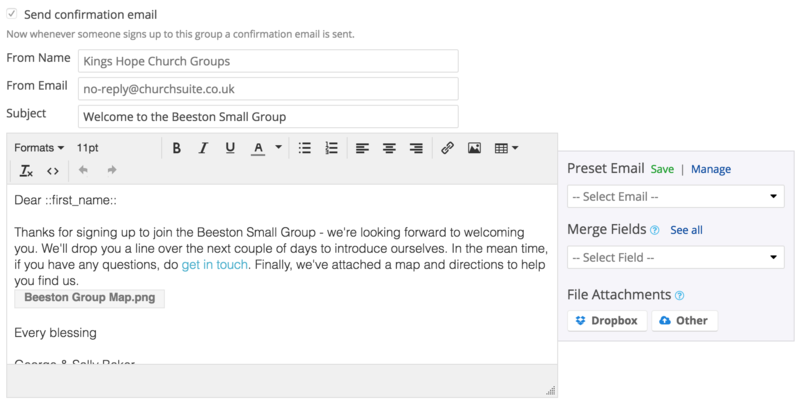 For each group you can customise the confirmation email that is sent to sign-ups. We always send a 'system' sign-up confirmation, which confirms the sign-up contact details submitted (in obfuscated format) and details of the group the person signed up to. If you choose to customise the confirmation email, the 'system' content is added to the end of your confirmation email. Finally, once a small group has been set visible, to "Show in Connect", and sign-up has been enabled, people can browse your groups and sign up (if sign-up is open and the group has capacity). A visual progress bar displays on the small group page shows the group capacity and available spaces. 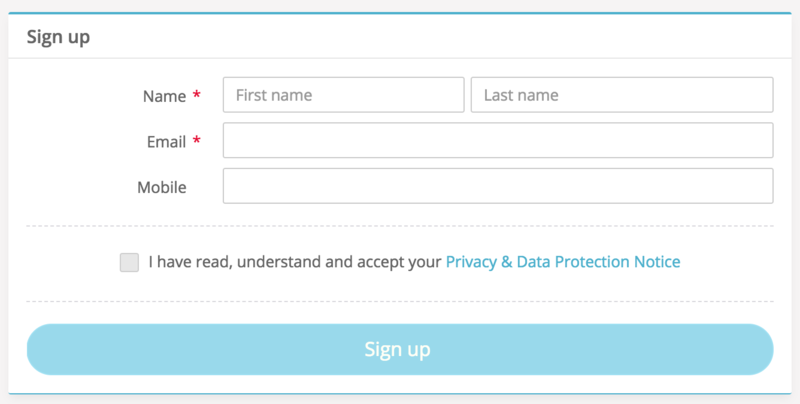 If the group is full, or the sign-up period has closed, the group remains visible in the embed list, but a message is displayed and the "sign-up" button is disabled. 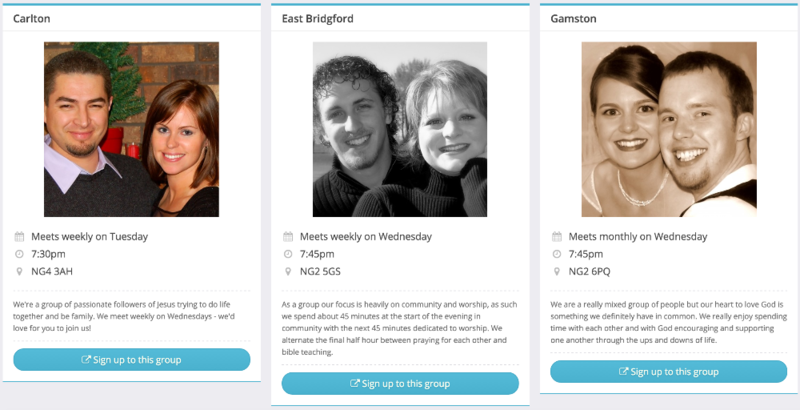 Connect > Group List can be configured to filter by Site (for multi-site churches), the Day the group meet, and Small Group Tags - essentially enabling you to customise your lists and map to only display those groups you wish, and to make it easy for prospective sign-ups to filter lots of groups to find just the one that's right for them. 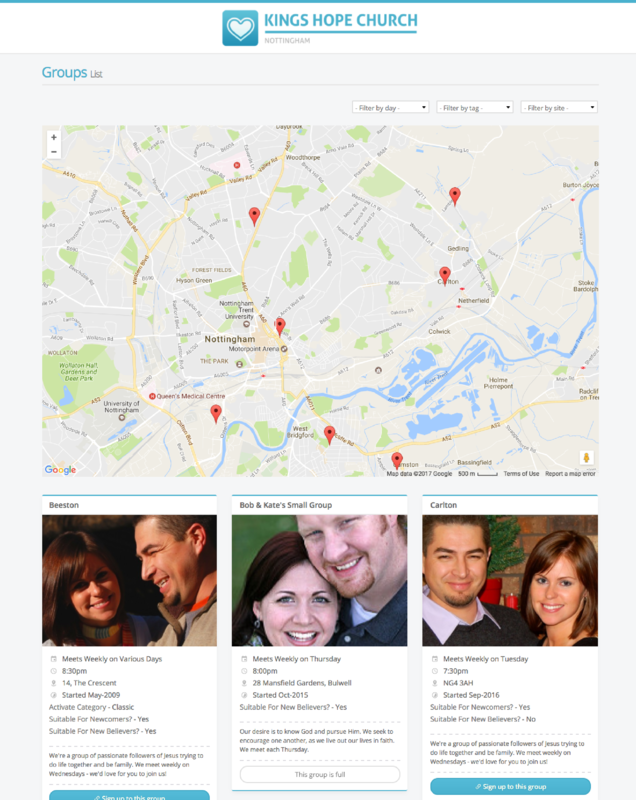 For multi-site customers, 'unmatched' successful sign-ups are added as Address Book contacts to the "pending" section for the same Site as that of the Small Group to which they've signed up to - the contact is flagged as being part of their Small Group's Site and is visible in the 'pending' section of the Address Book. Signing up to a group in Connect works in exactly the same way as Embed, and uses the same sign-up form. ChurchSuite will attempt to match the sign-up details to an existing Address Book or Children contact. Clever matching algorithms attempt to match based on first name, last name, email and optional mobile. If matched, the sign-up is linked to their existing contact profile in the Address Book, joined to the small group member list, a "Joined group" Key Date is automatically recorded, and a Note is added against the contact to indicate the sign-up originated through the Groups online sign-up form. Sign-up via Connect > Group List is managed on a group-by-group basis, allowing you to enable sign-up on some groups but not others, if you wish. In "Small Groups" > "Groups", select each group in turn and click "Edit group". Scroll down to the "Visibility" section and check "Show in Connect" to make the group visible in Connect "Group List", and also check "Enable sign-up through Connect". Where sign-up has been enabled, specify the date range for when you want the sign-up period to be active for (this can be open-ended), and set any optional group capacity. The "Member List" setting is only relevant to groups visible in My ChurchSuite - Embed and Connect "sign-ups" can never view a group Member List until they are subsequently granted access to My ChurchSuite, so this setting can be ignored for Connect purposes. You can also set whether new group sign-ups are added to the group as active members, or with a pending status requiring the group leaders to approve the new member. Which groups show in Connect? By default, only active groups show in the Group List in Connect. Within the Small Groups module > Connect settings, there is an option to show active and future groups in the Group list and map. 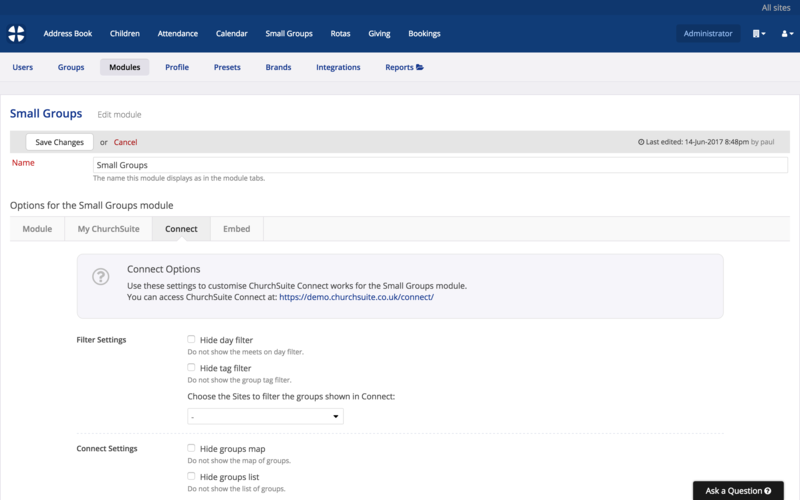 Note that while future groups can be shown in Connect (so people can view upcoming groups for next term), sign-up to future groups is still dependent on the sign-up date range set for each of your groups. Similarly, Connect will always respect each future group's visibility settings and only those future groups set as "visible in Connect" will be shown. Note also that the My ChurchSuite "Group Email" feature in My Groups will only work when the group is active or during the sign-up period - attempting to send a group email to a future group email address will result in a rejection email coming back. This means future group leaders can only email their future group members once sign up has begun or the group is active. If not already done, you can add a custom confirmation email that will be sent to all new sign-ups. The same confirmation email is received by signups through Connect, Embed and My ChurchSuite, so we recommend your message be generic enough to cater for all sign-up sources. Remember to save any changes made to the group before navigating away from the page. Repeat the above steps for each Small Group in your list. A great way to group similar types of group together is by using Small Group tags. You might create tags around oversight clusters, geographic areas, the group focus, or indeed anything you like. There's no limit to the number of tags you can assign to your groups. Once tagged, you have enormous flexibility with your Connect "Group List" filtering, to provide content-relevant group lists at your Information Desk; making it even easier for people to find the right group and sign up. With the Small Group capacity setting you can optionally cap the number of sign-ups a group can receive. Once a group is full, no further sign-ups are permitted via My ChurchSuite, Connect or Embed. 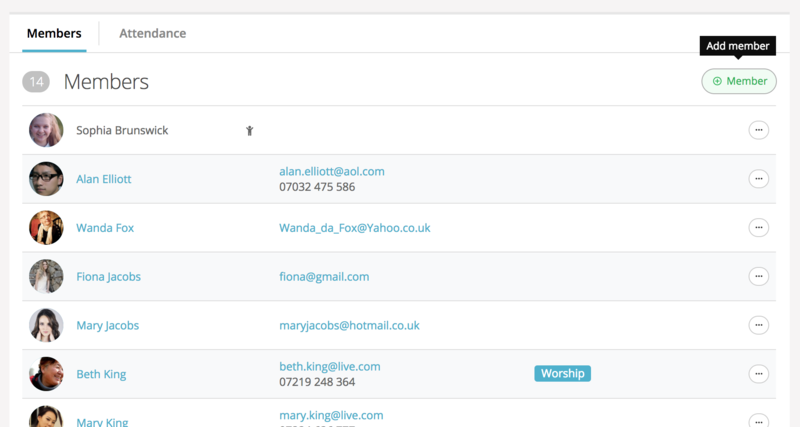 Note that active Address Book contacts can still be manually added to the group by a User via ChurchSuite's admin-facing system, allowing you discretion to override the capacity cut-off. Similarly, Small Group leaders, or those with roles for 'group edit' functionality enabled for My ChurchSuite, can also add members to their group, in effect overriding the group capacity.